Hot and Naked, and a Boomer! I rarely gush: now, though, I will. 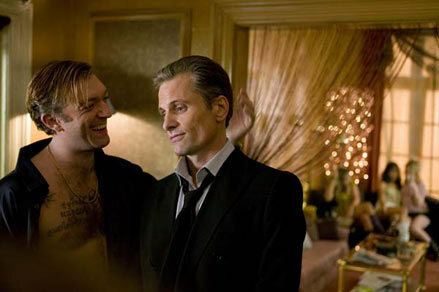 About Viggo Mortensen's new movie, Eastern Promises. Another wonderful movie with a terrible title (just like Lars), this focuses on Mortensen, who plays Nikolai, a densely-tattooed Russian mobster living in London. A midwife, Anna, played by the always-lovely Naomi Watts, helps a young girl give birth, just before the new mother dies. Anna confiscates the girl's diary, written in Russian, and eventually discovers that the girl was only 14. She begins a search for the girl's family, so that the baby will not have to go into the foster system. The journey leads her into a very dark underbelly of a Russian crime syndicate, one in which bad guys do really bad things. And they do most of it with incredible violence. It takes her some time to realize the danger she's in: on the other hand, she gets close to Nikolai: lucky girl. Despite his Icelandic- sounding name, Mortensen was born in New York City--in 1958!! When you see the steam bath scene-- in which a completely naked Mortensen fights off and kills two fully-dressed Chechen assassins--you, too, will be amazed that this man is nearly 50 years old. 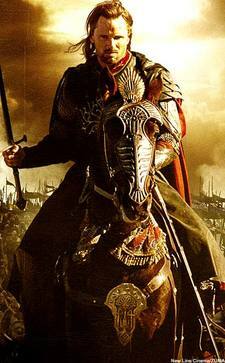 Mortensen as Aragorn looked fairly fantastic, but never this incredibly great! Okay, I'm finished gushing now. By the way, this movie is incredibly, appropriately violent: if you do not murder by knife, machete, scissors, and other cutting instruments, do not see this movie. On the other hand, nobody uses a gun. These British Russian gangsters must never have heard of the NRA.